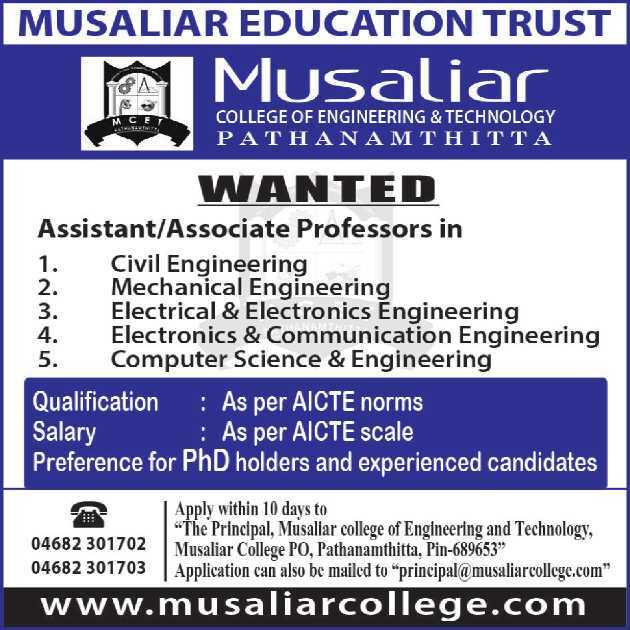 Musaliar College of Engineering & Technology, Pathanamthitta has advertised in THE HINDU Opportunities newspaper for the recruitment of Associate Professor / Assistant Professor jobs vacancies. Interested and eligible job aspirants are requested to apply within 10 days from 01st November 2017. Check out further more details below. About College: Musaliar College of Engineering and Technology is an ISO certified prominent institution under the renowned Musaliar Education Trust. The Musaliar Education Trust which is a charitable trust was founded in the year 2001 by a group of well settled educationalists and technocrats having vast experience in the educational and technical fields. The College is comfortably located in a sprawling campus within the town limits of Pathanamthitta Municipality. How to Apply: Interested and eligible candidates are requested to send their applications along with CV, copies of educational certificates and recent passport size photographs to the following postal address or email address.